Russia's constitution sets a limit of two consecutive presidential terms, and President Vladimir Putin says he'll abide by that law. It seems like Russian President Vladimir Putin might be ready to give up the presidency when his current term ends. 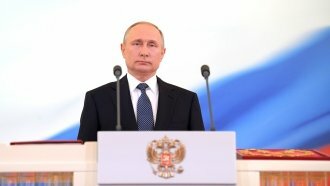 The Russian constitution sets a limit of two consecutive presidential terms, and Putin said on Friday he plans to obey that rule and step down in 2024. Putin has run into this limit before. He served two consecutive terms as president from 2000 to 2008. He then spent four years as prime minister before being elected president for the third time. Reporters recently asked Putin if he plans to make a similar move when his current term ends. He laughed it off, saying: "Am I supposed to be in this post until I'm 100 years old? No!" Putin's current presidential term is set to end in May 2024.